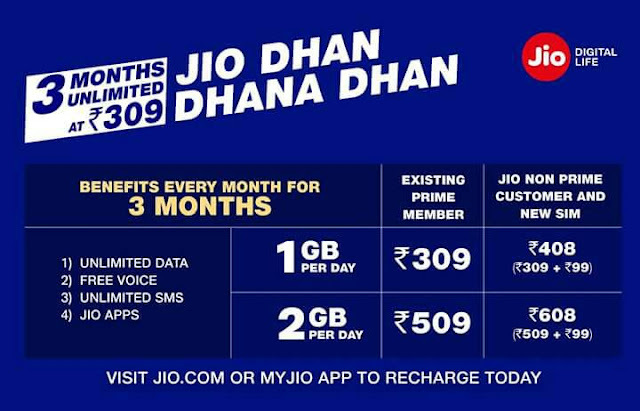 UPDATE : Jio Dhan Dhana Dhan offer is live and you can recharge It at MyJio App Or Jio.com or You can visit the nearest Retailer. Jio keeps Surprising every One . Now we have Sources tells their new Plan is Ready for its all Jio customer and This time Jio coming with Jio Dhan Dhana Dhan IPL Offer .Yup You Here Right this time it is IPL offer and name is Dhan Dhana Dhan Because JIO is title sponsor of IPL so they name it with this. As you know Guys Jio all-ready Giving us a lots of benefits under Happy new year offer now jio gives its user 15 days time to enroll in prime membership but after TRAI intervene in this Jio going to soon end summer surprise offer to Tackle this situation Jio comes with Jio Dhan Dhana Dhan IPL Offer where jio users same benefits like happy new year only difference here is Price. So lets Take See what was the New Jio Dhan Dhana Dhan IPL Offer all about and what plan and benefits jio offer this time . As You see above table Jio soon Going to end 303 Plan and come up with Rs 309 and Rs 509 Plan for its Prime members. Here Prime members Those who already Recharge Rs 99 and take membership. Prime members on the recharge of 309 users get 1 GB 4G data daily with Prime benefits which include all their Premium app services free and If you recharge with 509 Plan You Get 2 gb 4G data daily with Prime benefits. So Guys many Jio customer do’t want to enroll Prime membership or some reasons they do’t Get Prime membership then jio Giving them chance too to enjoy jio prime benefits like if after few months you want to use jio prime plan and you do’t enroll prime membership then you still get prime benefits by paying some extra amount. And this plan come with Rs 349 and Rs 549 where in Rs 349 Plan you Get 1 GB 4G data with Prime Benefits and in Rs 549 You Get 2 GB daily 4G data with Prim benefits . So we have talked prime and non Prime members above offers Jio also giving New customer same offer who join in future in Rs 408 and Rs 608 where in Rs 309+99=408 Recharge New users get 1 GB 4g data daily with Prime benefits and in Rs 509+99= 608 new users Get 2 GB 4G data daily with Prime benefits. So Friends Jio again Play Master Stroke in DATA war and If you see it is very cost effective plan to Bring existing and new user with Jio and enjoy digital benefits .Still Guys i want to clear this offer is circulating in Jio recharge centers But Jio website doe’s Not show this offer so we wait for official announcement i have got news so shared with You.